Okay, the different colors are not really what makes Ganz schön clever special. It’s what you do with them. The starts out like every other roll-and-write: You play in rounds, per round each player takes a turn, on their turn a player may roll the dice up to three times. That last part is not quite universal, but it’s common enough. Each roll you pick exactly one of those dice. This is where the colors come into play. For the dice you pick you make a mark on the part of your score pad in the matching color. How exactly those work, and how you score points for them, I’ll explain in a moment. First, there’s one more wrinkle in how you pick the dice. When you pick one die, then you discard all dice with lower values. You won’t get to roll them again this turn, and you won’t be able to pick them with their value from this roll, either. You know who will be able to pick them, though? Your opponents. At the end your turn they will all pick one die that you didn’t choose this round and mark it on their own score pad. That includes the dice left over at the end of your turn, so you can’t deny the others those dice. But when you discard those dice because you picked a higher number, then you also pick some values the others will have in their selection. You can absolutely deny them a yellow six they might need. Which brings as back to what you do with the different colors. Each color has its own section on the score sheet, and each section works differently. In Yellow you have a grid of numbers from one to six. When you pick the Yellow dice you cross off one box of the die’s value. Completed columns give you points, completed rows a variety of other bonuses. The blue die always comes together with the white one, and so the blue grid has numbers from two to twelve. Points based on how many squares you cross off, bonuses for rows and columns. The white die doesn’t have its own associated space on the score sheet. When you pick white alone it works as a wildcard and you can use the value in any section. Green, orange and purple each have a line of boxes, not a grid, and you fill it from left to right with numbers. In green each space has a minimum value and you score for the number of spaces filled. In orange you put whichever number you rolled and score the sum of all numbers. Finally, in purple, you score the sum again, but each die you score here has to have a higher value than the one before – except if that one is a six, then you can follow up with anything. In all three lines, you gain bonuses when you reach the spaces marked with them. We’ve talked about those bonuses a lot now, what is it with those things? 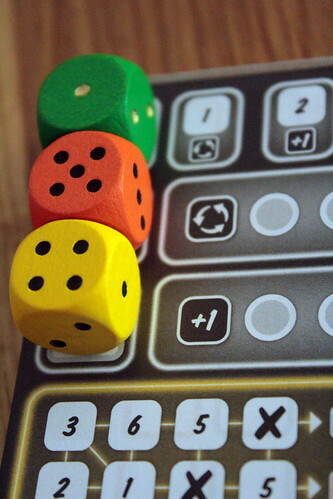 Well, those are what really brings Ganz schön clever into Kennerspiel territory, because using them to best effect requires a very unusual amount of strategy for a roll-and-write. Most of those bonuses have an immediate effect to let you put a mark or a number in another section. Completing a row in yellow might allow you to mark a space in blue. Any space. Chain reactions are not only possible but encouraged, so if that mark in blue completes a row there it could give you a mark in green, which might give you another mark in yellow, which might give you a five in orange. How do you use them effectively? Well, an X in green is more valuable when you need a six for the next space. An X in blue is more valuable on the rarer two or twelve than it is on the seven – unless you can pick those from regular rolls, then you’d feel bad about wasting your bonus before. But don’t keep your options open too long, or you might not get the right dice to activate your bonus any more, and that would be even more wasteful. Timing is everything. There are two more bonuses that you don’t have to use immediately but at any time after you earn them. 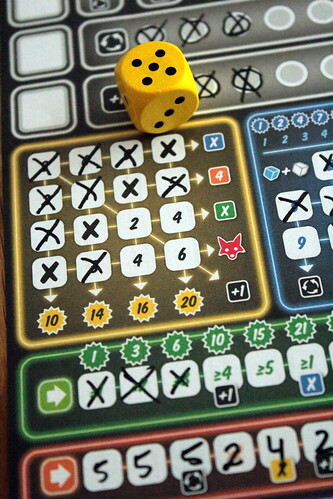 One lets you reroll your dice before you pick one. The other lets you pick an additional die. As the active player you may pick one of your own discards, as a scavenger you may pick a second die that may even be one of the dice the active player used. Finally – it seems there’s always one more thing, doesn’t it – there are the foxes. Those are worth an awful lot of extra points if you play them right. Every fox you pick up is worth as many points as your lowest scoring section on the score pad. So now, on top of everything else, you have to take care not to neglect one of the sections. Yay, more things to keep an eye on! It’s sort of a tradition that I disagree with the Spiel des Jahres jury about the games that make it into the Kennerspiel selection. I think they pick games too light to really be a Kennerspiel, and that would be my problem with Ganz schön clever as well. But, to be fair, it’s my only problem. Ganz schön clever may not be as deep as I would like for a Kennerspiel, but it does force you to make many interesting decisions, both tactical and strategic. From picking dice to timing your bonuses right to using your special actions, all choices are interesting. If situations without a real choice happen at all then it’s only in the last round, if not all dice you rolled still fit your score sheet. Even the interaction in Ganz schön clever is good, and that’s saying something in this genre of game. It’s not hugely interactive, but you should keep an eye on everyone’s score sheet and be aware what dice you leave for the other players. The other way round, everyone has an interest in what you do with your dice, so your turn is not downtime for everyone else. So like I said, I might disagree with the Kennerspiel nomination. Spiel des Jahres, though? Definitely! Ganz schön clever moves quickly, everyone stays engaged, there are meaningful decisions on every turn, and you can still learn to play in five minutes. 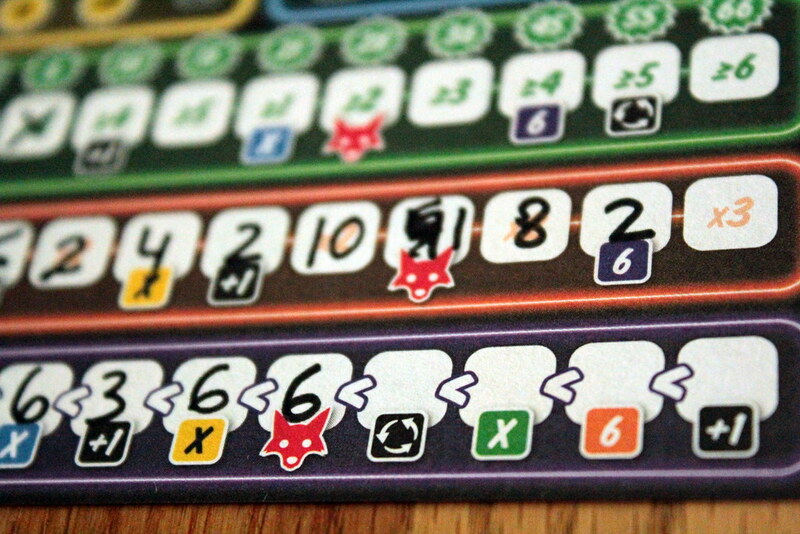 And the only bit of language dependence is the rulebook, for which there is already a translation at BoardGameGeek. So even though there is no English edition yet you can start playing without mandatory German classes. And you should, too.